In a cinematic released yesterday, legendary Horde warrior Varok Saurfang had a crisis of conscience over Sylvanas’ torching of night elf stronghold Teldrassil, the World Tree. Later, while talking to a young troll who’d yet to see battle, he threw off his shoulder armor in disgust at the idea that they’d find honor in the battle to come. Saurfang proceeded to storm off into the night sans armor, toward a big Alliance encampment—presumably to die. Despite being puny and inexperienced, the troll ran after him and removed his shoulder pads to show solidarity. In the end, he convinced Saurfang not to give up on himself and the Horde. 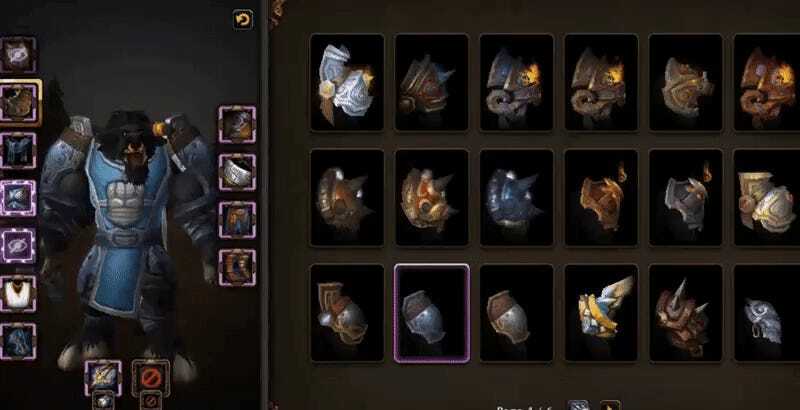 Now Horde players, still enraged by Sylvanas’ actions and inspired by the unlikely duo of Saurfang and “Zappy Boi” (as they’ve taken to calling the troll), are removing their in-game shoulder armor as a show of solidarity. Well, they’re not fully removing it—gotta keep those sweet, sweet stat buffs, after all—but they’re using WoW’s appearance-altering “transmogrification” feature to make their shoulder pads no longer appear on their characters. A player named Riizu has taken to heading up the “Shoulders For Saurfang” movement with both a Discord and an in-game community. The former, Riizu told Kotaku in a DM, already has 150 members, while the latter has 400. Like many other players, Riizu has been disappointed in recent pre-Battle For Azeroth developments, but saw Shoulders For Saurfang as an opportunity to express that in a positive way. “It must be clear to Blizzard that their recent choices with Sylvanas, and the Horde as a whole, aren’t well-received and that perhaps these choices are meant to intentionally incite more faction loyalty,” Riizu said. “The hope is that Shoulders For Saurfang can be a launch point for that. I hope that SFS can provide players a way to positively share their opinions and draw excitement to the expansion.” He also hopes that this will cut down on some of the “ridiculous” blowback members of the WoW dev team have faced. For now, things are just getting off the ground, but there are already plans afoot (ashoulder?). Shoulders For Saurfang will be hosting an in-game event on August 7, likely on a role-playing server, that’ll see players march from Horde capital Orgrimmar to Alliance territory Darkshore. Riizu also noted that even though Horde and Alliance are technically bitterer enemies than ever, Alliance players are welcome to join the Discord and help plan demonstrations, too. He said that he takes inspiration from the most recent Warcraft novel, Before The Storm, which serves as an official prequel to Battle For Azeroth.